Blow a giant bubble with 4M … an unbreakable bubble, a bubble film and more. Appreciate the simple beauty of bubble geometry, bubble art and bubble sculpture. Play lots of bubble tricks and learn the science of bubbles while having fun. 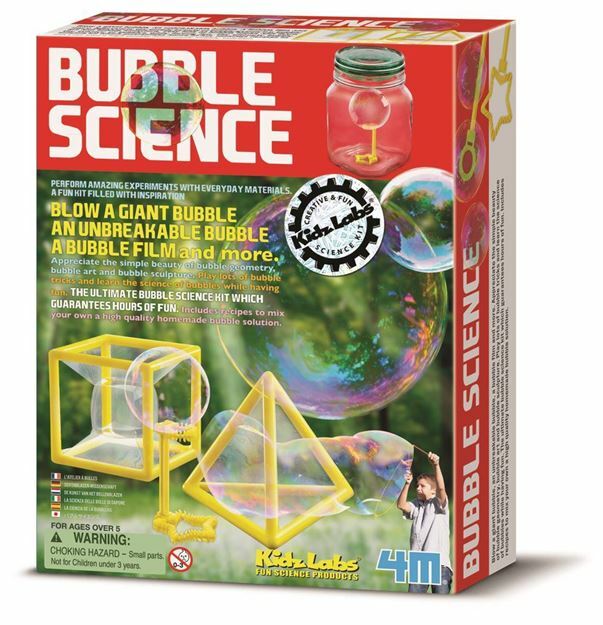 The ultimate bubble science kit which guarantees hours of fun. Includes: a bubble tray, plastic ring, coloured yarn, pyramid framed wand, cube framed wand bubble solution, 2 giant bubble wand stoppers, mouthpiece, assorted wands, 2 long straws and detailed instructions. Age 8+ years. Part of the KidzLabs range. Distributed in New Zealand by Holdson.